When you do research on FAI surgery, you often come across numbers that sound spectacular. You find claims that the surgery is about 80% effective in curing your hips of pain. If this number were correct, surgery for FAI would make a lot of sense. Why suffer with hip pain, clicking, and snapping when you can just do a surgery and be 100% back to normal? Everyone wants to be able to move well, play sports, and enjoy their daily lives, right? What’s the real success rate for surgery for femoroacetabular impingement? The real success rate of surgery for femoral acetabular impingement is unfortunately nowhere near 80%. A study published in January of 2013 investigated the relationship between patient expectations and hip surgery and overall satisfaction. In it, they looked at people’s goals for hip surgery (pain relief, improved mobility, etc.) and their satisfaction with the outcomes of surgery after 12 months. The study’s results included 86 patients. The top 3 reasons for surgery across all the patients was pain reduction, fear of worsening, improvement in performance of everyday activities. What was the result of the surgery for these patients? 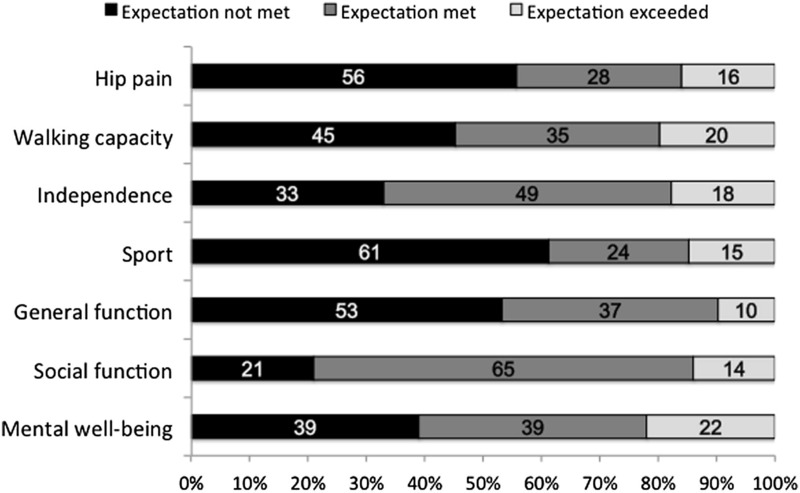 This chart, provided in the study, gives you a very clear illustration of how the surgical outcomes compared with the patients’ expectations. “Expectation not met” means that the outcome the patient hoped for simply did not happen. The three most relevant numbers there, in my mind, are the ones for hip pain, walking capacity, and sport. The improvement that patients were hoping for simply did not materialize. How did patients rate the overall effectiveness of surgery? 29% believed it helped a lot. 39% thought it helped some. 21% said it helped only a little. 9% said it did not help at all. 2% reported that it made things worse. These numbers shows that roughly one third of the patients felt like the surgery was a big help. Another third felt like it helped “some.” And the other third ranged from worse (luckily a small percentage) to getting only a minor amount of help. Research like this is important as it strongly indicates that something is wrong with the notion that hip immobility is a problem with the bones and further that surgery to correct the bone shapes and labral tears will drastically improve the situation. As mentioned in many other posts, a preponderance of good research published in the last several years seems to indicate that hip pain issues are not actually caused by FAI bone shapes, which means approaches to deal with hip pain should really be revisited and revised. Are you struggling with hip issues? If your hips are popping, snapping, or aching and you’re looking for an alternative to surgery, you’ll be interested in our do it yourself online program. The FAI Fix is designed to help you systematically address a wide variety of hip issues so that you can move your hips better and get back to enjoying your life.